Youth protection is something very near and dear to my heart. As a youth, I was abused by a family friend in a position of trust. This is something that one never gets over. Although this had happened to me over 30 years ago, I still am affected today through memories and dreams. In 2004, I was called to testify against my abuser when he petitioned to have his status changed from being a violent sexual predator. Even at 40 years old, it was one of the most difficult days of my life, seeing him again, face to face. In 1990, I volunteered to be our council's Youth Protection coordinator and held that position for the better part of 16 years. Youth Protection Program is not something we do because we have to do it. It is something we do because we want to. We are in Scouting because we care. Training youth and leaders about youth protection is not to scare them, it is to empower them. We don't expect them to injure themselves, but we teach them first aid. We don't expect them to get into an abuse situation, but we have to teach them how to recognize the situation and be prepared to deal with it. 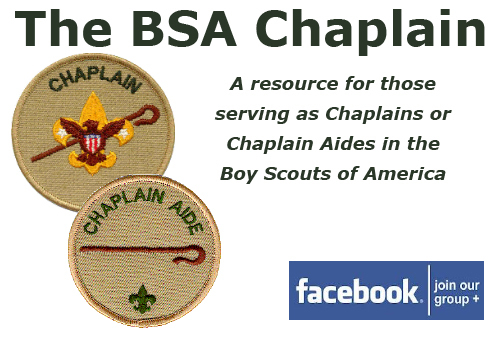 As a Chaplain, you may be the first to hear about an abuse situation either directly or indirectly. You will need to consider the privacy of the victim and accused abuser. Your job is not to pass judgment, investigate or even ask detailed questions. Your job is to listen, make mental notes and document those mental notes as soon as possible. Know your councils reporting policies and the reporting policies of your state. You may or may not have a legal obligation to report to child protections services, but you do have a BSA requirement to report to your council executive. Improved Tools to Encourage Prompt Reporting of Abuse: The BSA's Youth Protection Team has increased and clarified national standards for reporting inappropriate conduct, which were published in the 2011 edition of the Guide to Safe Scouting. Additionally, the BSA is publishing a series of fact sheets to help volunteers recognize various types of abuse and is launching new online tools to encourage prompt reporting. Mandatory Training for All Adult Volunteers: Effective June 1, 2010, the BSA required all adult volunteers to complete Youth Protection training every two years in order to maintain their membership. Since that time, approximately 640,000 people have taken the training. Johnson also has led a series of in-person workshops to review safety information and ensure volunteers understand how to recognize and report abuse. Social Media Guidelines: In conjunction with Youth Protection Month, the BSA released guidelines for Scouts and Scouting's adult leaders on how to safely use social media. These guidelines are available at: http://www.scouting.org/scoutsource/Marketing/Resources/SocialMedia.aspx (BSA Website - www.scouting.org) and are part of the BSA's continuing effort to enhance and expand its youth protection programs.